I'm terribly late on doing this review, but here I am. ;-) I blame preggie land, lol. So if you checked out my last video on YouTube, you already know I've been using Cantu (specifically the Cantu Shea Butter Leave In Conditioning Repair Cream & the Super Shine Hair Silk) . I even wrote a post about it a few weeks after I bc'ed. 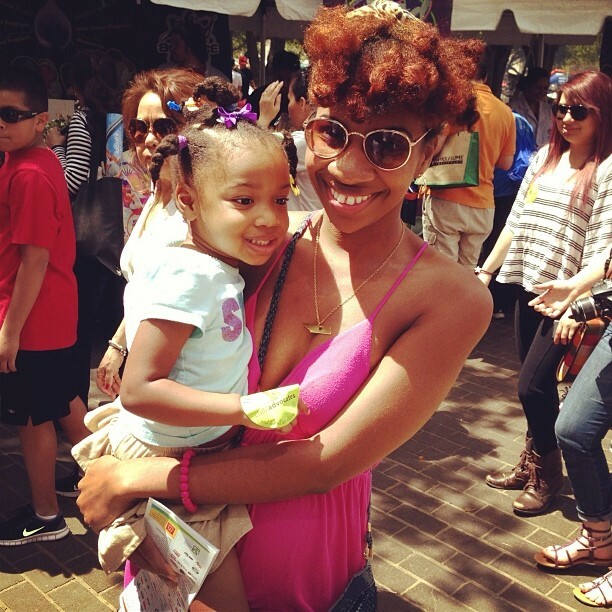 If you didn't check out my initial post on Cantu, here's what I do. 1. 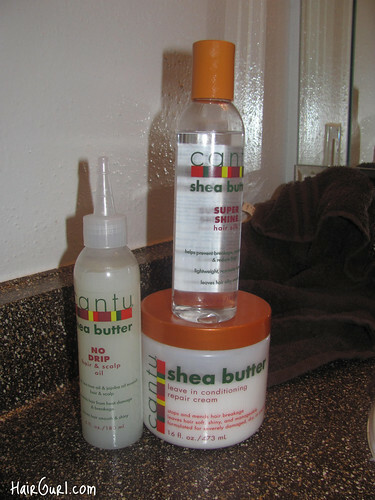 First, I apply Cantu Shea Butter Leave In Conditioning Repair Cream. I was sent a box of their products! This stuff smells like fruit. Yums. 2. Then, I put either the Cantu Shea Butter Super Shine Hair Silk or Extra Virgin Olive Oil in my hair. 3. I rub Eco Styler Styling Gel throughout. The way I rub it in, it pretty much defines the curl. So let me start off with the review for the Leave In. Cantu Shea Butter Leave In Conditioning Repair Cream is an intensive deep penetrating leave in cream conditioning treatment that is made with pure Shea Butter and other natural oils to stop and mend breakage, repair split ends, and add manageability and shine with every application. When used daily Cantu Shea Butter Leave In Conditioning Repair Cream helps promote strong, long, healthy hair. longer hair at the ends or problem areas. * Leave In Treatment – Apply as directed for “Daily Styling” just after shampooing. Re-apply and cover with a plastic cap overnight for maximum absorbtion and intensive conditioning. * Frizz Free Hair – Apply daily to split ends or damaged areas. Comb through and let dry naturally. In a nutshell, I love the Leave In Conditioning Repair Cream. :D I apply it to my hair after washing & dc'ing usually. It's the 1st thing I apply. My hair eats this stuff up & it makes it very soft. I rub it throughtout. You don't need a lot. I mostly use the cream when my hair is wet or damp. I've used it a few times on dry hair & it still defined my curls and moisturized my hair. The leave in cream does have a tendency to build up in my hair so I have to make sure I only use a small amount on dry hair. I can get away with using more on wet hair. I just try to make sure I don't overdo it. Cantu Shea Butter Super Shine Hair Silk provides super shine for all hair types without heavy, tacky buildup that weighs hair down. With pure Shea Butter, Cantu Shea Butter Super Shine Hair Silk also works as a treatment for frizz and split ends by bonding to each hair strand, filling in voids on the cuticle layer of the hair, and leaving hair stronger, healthier with brilliant shine. *Daily Styling – Apply approximately a quarter size amount of product onto the surface of the hair down to the ends. Comb through for even distribution. Do not rinse. Apply more to longer hair at the ends or problem areas. *Reconstructive Treatment - Apply to damp, not wet, hair. Apply a generous amount of product onto frizzy or distressed area. Wrap hair in a warm, wet towel. Leave on towel for up to 20 minutes. Comb through for even distribution. Style as usual. This is good stuff. The Hair Silk makes my hair very soft and it provides this shine to it. It's a serum so it has a very smooth & silky consistency. I apply it after the Leave In & let me tell ya'll they go great together! The Hair Silk does have cones in it so you'll need to use a clarifying shampoo to wash it out it thoroughly if you want to use this every day. 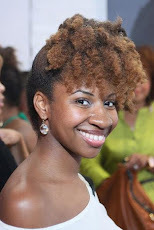 I'm officially a fan of Cantu Shea Butter now :-) Like Cantu Shea Butter on Facebook here: http://www.facebook.com/CantuSheaButter . I forgot to mention how good their products smell too. :D I can't use products if they stink no matter how good the ingredients are. Have you tried the Cantu products?? Did you like them? Yay or nay? Note: Cantu sent me their products at no charge. I'm not obligated to write a positive review in return. My review consists of my honest opinion of the products. lol!Yeah, I'd heard a lot of mixed reviews too. I tried it years ago, but I don't remember specifically liking it. I remember using the serum and the oil when they first came out. I actually enjoyed the results that these products gave me. PJism is the only reason that I haven't returned to my oldie but goodies. I love cantu.. i had alot of problems with my hair breaking and since i have been using this i haven't seen any breaking and my hair is growing from it... some people say it's not good for relaxed hair but maybe they are using it wrong cuz my hair is relaxed... GO CANTU!!!!! I enjoy Cantu. I"ll recommend it to any black woman. I used it up to last night as my hair was all hard and tangled (new growth as I am due for a relaxer) and after uing Cantu conditioner - bingo it was all soft again. Another positive comment on Cantu is it grows the hair.